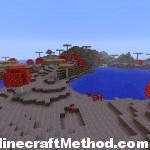 [showmyads]Its been a while since I posted a good mushroom biome world. 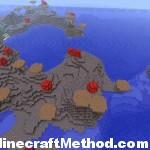 This one is nice because you spawn in it, so no need to walk a long distance. Of course you have a food source right there. 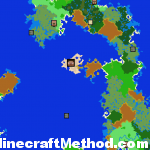 Looking at the world map there is not much nearby, if you want to go for a swim there is a jungle temple/village/stronghold not too far away. The highlight here though is the spawn point. 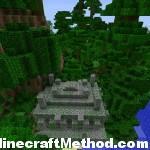 The jungle temple (emerald in the chest) is at X: 230 Z: -665 and there is a ravine nearby. There is not much else to say about this one. Here are some screenshots.